In an attempt to place his mark on politics Donald Trump, after his election in 2016, surrounded himself for the most part with politicians loyal to his person. His lack of constancy and basic knowledge of the issues led him to intervene frequently in the competence of the ministers. The unpredictability of this personal regime weakened international confidence in American politics. Trump was borne by the conservative elite. They supported his foreign policy, marked as it was by his vanity and prestige-oriented mentality, with which he wanted to lead the USA into the position of a world power. Through the president’s ill-considered comments and undiplomatic manoeuvres the nation lost its allies. 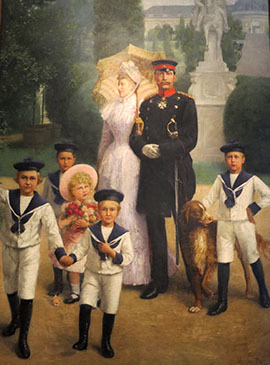 In an attempt to place his mark on politics Emperor Wilhelm II, after ascending the throne in 1888, surrounded himself for the most part with politicians loyal to his person. His lack of constancy and basic knowledge of the issues led him to intervene frequently in the competence of the ministers. The unpredictability of this personal regime weakened international confidence in German politics. Wilhelm was borne by the conservative elite. They supported his foreign policy, marked as it was by his vanity and prestige-oriented mentality, with which he wanted to lead Germany into the position of a world power. Through the emperor’s ill-considered comments and undiplomatic manoeuvres the empire lost its allies. Remarkably accurate isn’t it? You can read how I came to own a pair of cufflinks from the Kaiser in a blog from 2011.